Last monday, I did a review of The Body Shop Passion Fruit Shower Gel. In that post I've mentioned that I bought that shower gel on a deal with 1 shower cream and 2 fragrance oils. The shower cream that I talked about in that post is this shower cream. Introducing The Body Shop Shea Shower Cream!! So for this post I'm going to share with you what I thought about this product. Just keep reading to find out more. Dry skin will love our soap-free cleanser, packed with moisturising Community Trade shea butter. You'll feel the softness. Shea butter - Moisturises and helps to soften the skin. Sesame oil - Moisturises and helps to soften the skin. Provides vital income for small-scale farmers. Sunflower oil - Also moisturises and helps to soften the skin. Provides essential fatty acids that help to repair the skin's moisture barrier, thus helping to restore moisture, smoothness and suppleness. Squeeze out onto the palms of your hands or on a body scrubber/sponge/loofa (or whatever your using) and massage over your body. The Body Shop Passion Fruit Shower Gel is contained in a see-through bottle with a flip cap where the shower cream easily comes out. It's a soap free cleanser which has a rich creamy softening lather. Lovely scent. It's one of the reasons why I've picked up this shower cream. I was captivated by it's classic, clean scent. It won't last long after washing though. The shower cream is easily discharge from the bottle. Moisturizing. I feel like applying lotion all over my body that foams when in contact with water. It doesn't dry out my skin. It has a lovely texture. I find this product obviously very creamy but not oily at all. Can be pricey. One 250 ml bottle cost $12.90 SGD. Surprisingly, I love this product. It doesn't dry out my skin and I honestly love the scent. Will be repurchasing this product again in the future. 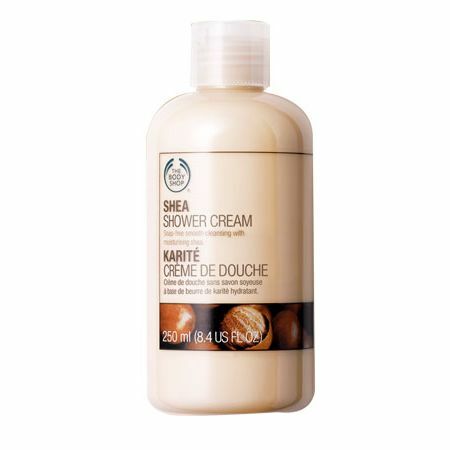 Have you tried The Body Shop Shea Shower Cream? Let me know what you think about this product in the comment section below. Hey Gladys! I love this product. Of all products from body shop, it is my favourite scent too. Travel Outfit Ideas: Beat the Heat!